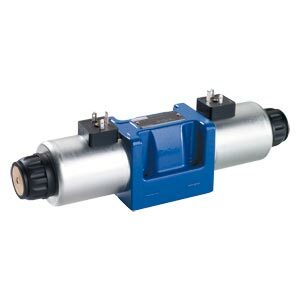 The Bosch Rexroth Valve type WE is a direct operated, directional spool valve with solenoid actuation. It controls start, stop and direction of the flow. Bosch Rexroth Directional Spool Valves connect or isolate the connections by moving a control spool within a housing bore. Neilson Hydraulics is a sales partner for Bosch Rexroth Hydraulics. Neilson Hydraulics supplies Bosch Rexroth Directional Valves, Bosch Rexroth Pressure Relief Valves, Bosch Rexroth Pressure Reducing Valves, Bosch Rexroth Check Valves, Bosch Rexroth A10VSO Axial Piston Pumps, Bosch Rexroth Vane Pumps, Bosch Rexroth Filters & Elements, Bosch Rexroth Accumulators, Bosch Rexroth Cylinders, Bosch Rexroth Electronics and Bosch Hydraulic Accessories (Bosch Rexroth Hirschman Plugs, Rectifier Plugs & Coils). This entry was posted on February 6, 2019 at 3:48 pm. You can follow any responses to this entry through the RSS 2.0 feed. You can leave a response, or trackback from your own site.